There are plenty of dog lovers out there who wish they had a furry friend of their own, but don't have the extra time or income to care for a dog. Until recently, we dogless dog people had to suffer in silence. But now there's a new app that allows you to become a dog walker on demand. The app is called Wag and it relies on the same sharing principle as other app services like Uber and Airbnb. 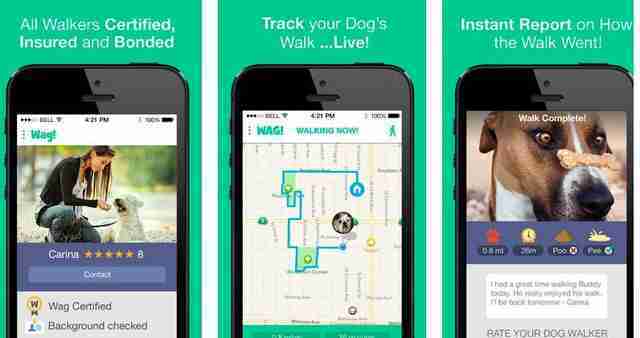 Essentially, Wag lets people sign up to walk a dog whenever they have some free time on their hands. The first step to becoming an instant dog walker is filling out an application, which involves answering questions like, "What qualities do you have that would make you a good dog walker?" and "Do you have any experience working with animals?" Applicants have to be able to pass a background check - but as soon as you're approved, you can start walking dogs whenever you want! If you're listed as "available," a dog owner nearby can send you a request and you can be hanging out with a pup in minutes. Plus, you can make some extra money on the side as well. The app works in reverse too, letting dog owners schedule a dog walker with only a moment's notice, all from their phones. The best part is, 10 cents from every mile walked is donated to Best Friends Animal Society to help animals in need. The app's founders want to use technology to "make dog ownership easier, which in turn should increase adoption rates." The mission statement on their website says, "it's about time that our furry loved ones have an app for themselves on our phones!" And for those of us who wish we could hang out with a pup every once in a while, this app is totally pawsome.